Last Sunday, on 09.10.2011, in-form striker Emmanuel Baffour of New Edubiase United FC scored a hat-trick in the first round of the GLO Premier League 2011-2012. In this article, I will present this exciting player. My first record of Emmanuel Baffour is from the GLO Premier League 2007-2008. Baffour was a fringe player at Liberty Professionals FC and was mostly used as a substitute. He did not score any league goals during the season. Before the GLO Premier League 2008-2009, Baffour was transferred to Tema Youth FC. In the registration document, published by the Ghana Football Association in November 2008, Baffour was registered with the date of birth 02.04.1989. According to the registration document, Baffour is a former player of “Ashalaja FC”. As far as I know, Ashalaja is a township in the Greater Accra Region. 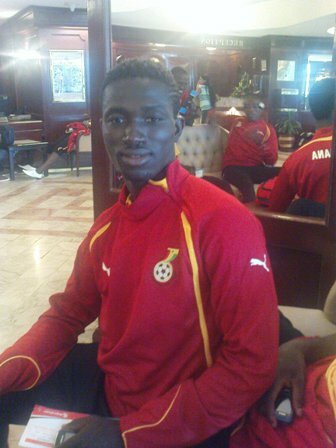 A player called “Emmanuel Baffour” was part of the Ghana U-17 national football team in June 2004. At the time, this player was based in the “Greater Accra Region”. Personally, I think this is the same Emmanuel Baffour I am presenting in this article. It makes sense that Baffour was part of the Ghana U-17 national football team as a fifteen year old boy back in 2004. In other words, Baffour is 22 years old at the time of writing. It should be noted that there is some confusion regarding the age of Baffour. According to Yahana Consult, a sports management consultancy firm, Baffour is born “02.04.1990”. The same source states that Baffour is 182 centimeters and 78 kilos. Baffour had a wonderful season for Tema Youth FC and I can document that he scored seven league goals. It seems likely that he scored once more. Unfortunately, Baffour’s goals could not save Tema Youth FC from relegation. Baffour stayed with Tema Youth FC for the following season, playing in the Division One League, the second level of Ghanaian football. It is difficult to find information about his performances during the season. However, Tema Youth FC failed to win promotion and Baffour decided to leave the club. In 2010-2011, Baffour was back at top level as he joined New Edubiase United FC. Baffour scored five league goals during the GLO Premier League 2010-2011, being part of an impressive attacking trio together with Stephen Manu (born 21.01.1985) and Fuseini Nuhu (born 20.06.1989). In March 2011, Baffour was part of the Ghana U-23 national football team that failed to qualify for the 2012 London Olympics. In April 2011, Baffour played for the Ghana B national football team in a friendly match against Sierra Leone. In May 2011, Baffour was part of the Ghana B national football team that participated in the 2011 WAFU Nations Cup, an international home-based football competition. This summer, Fuseini Nuhu left New Edubiase United FC for Moldovan side FC Tiraspol, while Stephen Manu is currently unsettled. Baffour will most likely be the top striker at the club this season and he has a huge responsibility on his young shoulders. However, based on his three goals last Sunday, he the responsibility does not seem to weigh him down. Baffour is a classic centre forward. It is my impression that he is pretty much an all-round striker, without any major weaknesses. He is a good dribbler and is able to control the ball despite lack of space. He is calm in front of goal and a tough opponent in aerial battles. He is rather slim and I honestly think he is taller than 182 centimeters. Baffour is currently responsible for set-pieces at New Edubiase United FC. One of his three goals last Sunday was apparently a beautiful free-kick. There seems to be some confusion regarding the name of Baffour. Many sources refer to Baffour as “Emmanuel Baffoe”, which is wrong. According to Yahana Consult, the full name of Baffour is “Emmanuel Awuah Baffour”. Baffour is definitely an interesting player and should fit in nicely at a mid-level European club. He is highly regarded in Ghana and should be able to cement his place in the squad of the Ghana B national football team the following season. The picture of Baffour is taken from Sports in Ghana.